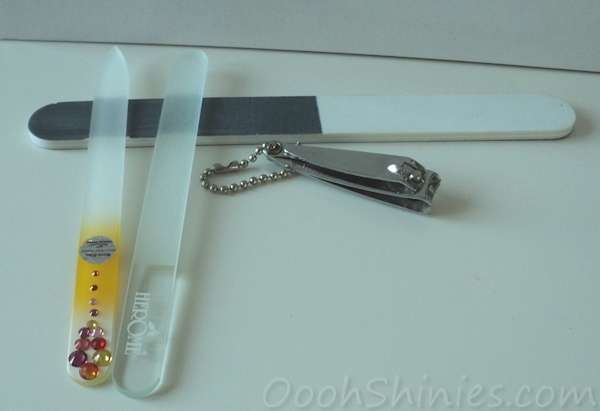 I always start with filing my nails, the only files that I use are glass files and a 3-step buffing file. I never clip my nails, because a clipper puts pressure on the layers of your nails and my nails don't like that at all, they chip much faster when I do clip! However, I do use a clipper to clip away so called hangnails. The glass files that I use are a fine one from Mont Blue* and a slightly coarser one from Herôme, the clipper and buffing file can be from any random brand. I don't often buff my nails, because it takes off the top layer and using it often will weaken them (and if you have ridges on your nails, you could also use a ridge filling basecoat instead!). But I always use it to smoothen out the tips of my nails after filing them. I use a remover pen (more on those further down) with water to clean under my nails if it's needed, never with anything hard. My nailbeds have grown a lot since I stopped using hard things, and usually simply washing them or cleaning them with a soft tip of a remover pen, works fine! Next step in my routine is using a cuticle remover, which is a product that removes excess skin and softens the cuticles. I never trim my cuticles, using a remover is a lot more gentle and does the trick just fine! 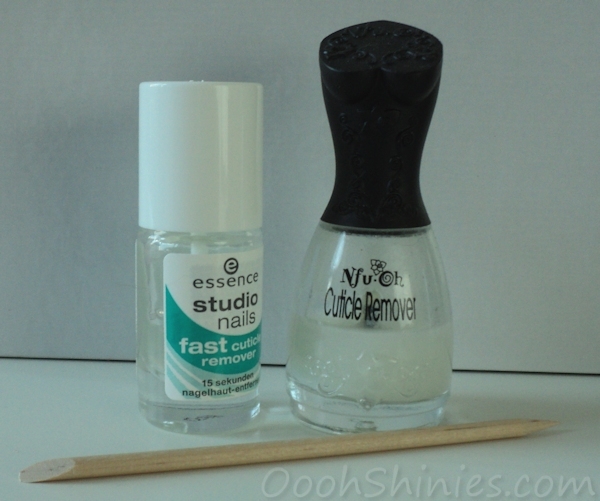 Quite a few brands have a cuticle remover, but I've only tried 2 of them, the Essence Fast Cuticle Remover and the Nfu.Oh Cuticle Remover. Both of these work excellent! The difference is that the Essence is more of a gel, while the Nfu.Oh is a lot more liquid, and the Essence is a lot cheaper and easier to get. I apply one of these to my cuticles, one hand at a time, and use one of these wooden sticks to remove it again. After that I wash my hands and done. The sticks that I use are from eBay, you can buy them in stores as well, but they're so much cheaper on eBay! I payed about €1,50 for 100 of them, including shipping (search for something like nail art orange wood stick). These sticks are also ideal for nail art (I use them for marbling for example) or to apply rhinestones with the pointy side. Now it's time for a basecoat, I use one of these depending on what I want to wear on my nails. I'll go for the Essence Peel Off Basecoat (which is pretty much crafting glue, there's more info about it here) for glitters. For holographic polish I use Make Up Store Aqua Fix, this gives a smoother application, makes the holo a bit more visible, and I often find I need less polish with this base. Especially the last part is great when wearing one of those hard to get and/or expensive holos! For normal polish I use Trind Nail Repair* or OPI Nail Envy. I've tried other nail hardeners or basecoats with nail hardeners as well, but some of them made my nails hurt! If you experienced that as well, a different product might work better for you too, and do use such products according to their directions. 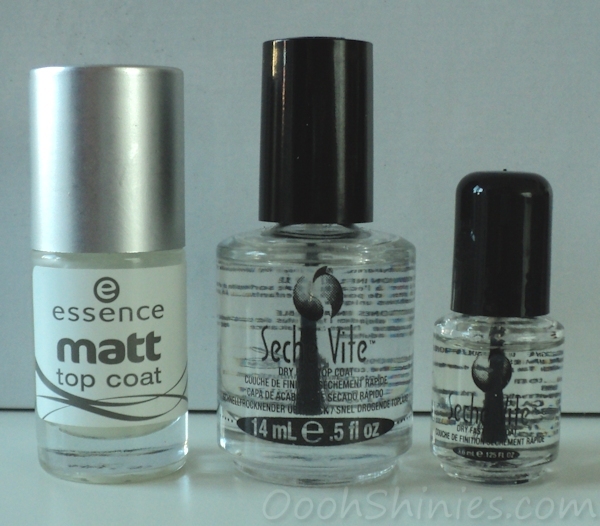 For matte nails, my standard top coat is the Essence Matt Top Coat. I've tried other brands as well, but this one gives the matte result that I like (some give more of a chalkboardy result, others are more satin), and this one stays well so far (I've had a few that got weird, little white flakes in it after a while that also transferred to the nail). This Essence top coat has been replaced with their Soft Touch top coat which is a special effect topper, and I think it's basically the same thing in a different bottle (and I forgot to add it to the picture, oops!). Tip: when you want to mattify your nail art, apply normal top coat first, I've noticed matte TC can easier smudge your design. Tip: don't go fish for your top coat when your bottle is almost empty, just put it aside and start a new bottle. When that's going down as well, just place them on top of eachother and you'll end up with plenty top coat again! This of course works with other polish as well, but I seldomly have to do this with anything but top coat. I keep the empty bottles for frankening polish. And to help polishing, especially with bottles that aren't as full anymore, I have these weird looking things that can keep the bottle at an angle! As you can see, a normal shape bottle fits, but so do the bigger bottles. 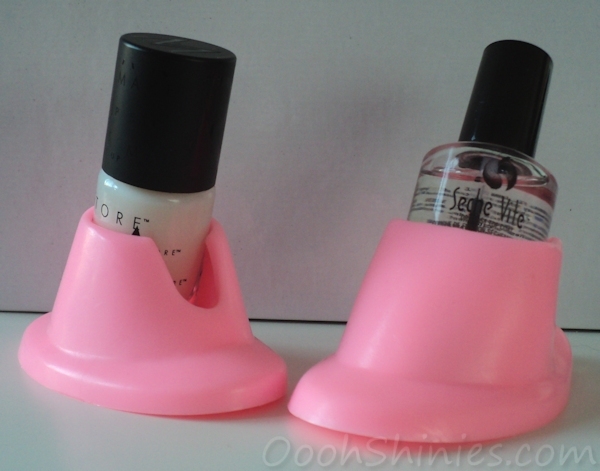 These are from eBay (search for something like nail polish bottle holder). I think they are quite handy - if I remember to use them! Especially when you mixed your top coat it can be a bit thicker than you'd like, or when any other polish gets too thick or is too gooey to apply nicely, thinner is the answer! Never use polish remover to restore your polish, it might look like it works at first, but the fact that it's made for removing already says enough, it'll destroy polish. Thinner on the other hand, just refills the stuff that's gone in your polish. Just add a few drops, roll the polish in your hands or shake it, and repeat until the consistancy is nice again. Here you can see what thinner can do for your old polish! 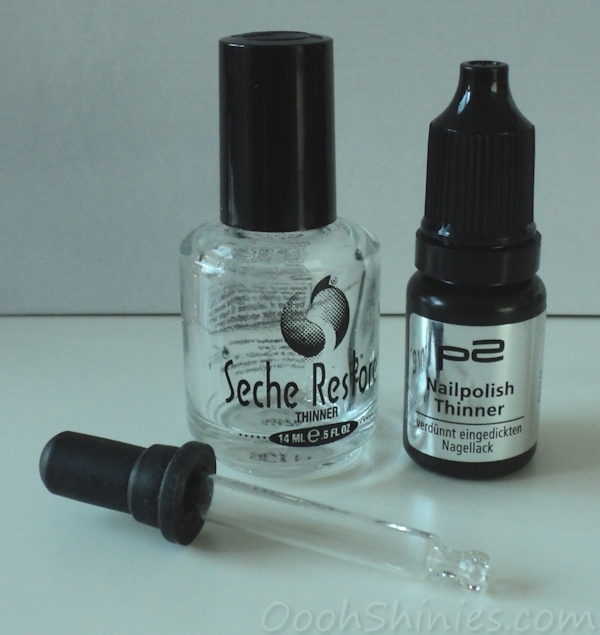 The thinners that I have are Seche Restore (and yes, it's aaalmost empty) and P2 Nailpolish Thinner. I don't often use quick dry products for the simple fact that Seche Vite dries so fast already, but also because these products contain some oils to moisturize your cuticles. That can be nice, but it would've been great if this stuff would come without oil too, to quickly dry layers when working on nail art without getting greasy nails! 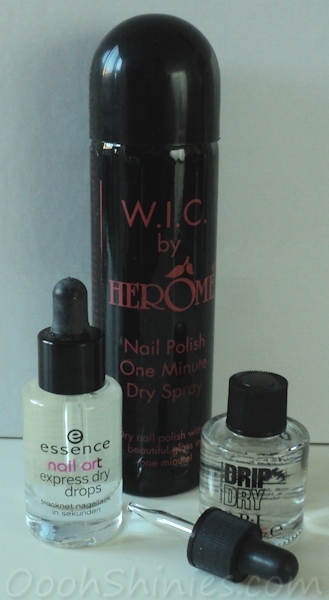 Anyway, the ones that I have are the Essence Express Dry Drops, the Herôme One Minute Dry Spray* and OPI Drip Dry. The spray is my favorite, it's so easy to apply, and more fun to use as well! After I'm done with polishing I do a cleanup, which is using a remover pen or (slanted) brush dipped in remover to remove excess polish around your cuticles. The brush shown here is from BornPrettyStore* and works nicely, but you can use other makeup brushes as well. But unlike most bloggers that I know of, I actually prefer cleanup pens! The one shown here can be bought on eBay (search for things like nail polish remover pen or corrector pen, they often come in sets of 5). I pour some remover in the cap of the bottle, place the cap of the pen in the bottle and dip the pen (or brush) in the remover. I swipe it off in the remover and on a cotton pad in between, and when I'm done, I pour the remover back (when the cap is filled with glitters, you can just rinse it out). I prefer cotton pads over balls, because balls can leave little bits of it on your brush/pen. Using acetone-free remover actually seems to dry out my nails and fingers more, so I'm going for remover with acetone, and because I use so much of it, I use one of the cheapest. My standard remover is from Euro Profit Essential. Cleanup pens come in different versions, from soft to very hard, pointy to straight and from cheap to more expensive. My favorite? The cheap ones (2nd one here)! They have the right shape and are quite hard, which I often prefer, especially when it comes to glitter polish where I find it really nice to be able to put some pressure to remove glitters. The 1st one is also one of those cheap eBay ones, but I don't like the rounded top (the right side of it here), so when buying those I do try to look for the shape of the 2nd ones, also from eBay. The 3rd straight ones (OPI, but also HEMA and Essence) are usually quite hard as well, but the straight shape just doesn't work for me at all! The last (Essence, also Herôme) have a great shape but are a bit too soft for my liking, and they get fluffy faster. However, these are nice to clean under my nails, but then I don't use remover but water instead. When one of the tips gets fluffy (they all do sooner or later), I just grab a new pen and use the fluffy, old pen for rough cleanup, like for the sides of my nails when I'm stamping, and use the new pen for the finer areas. 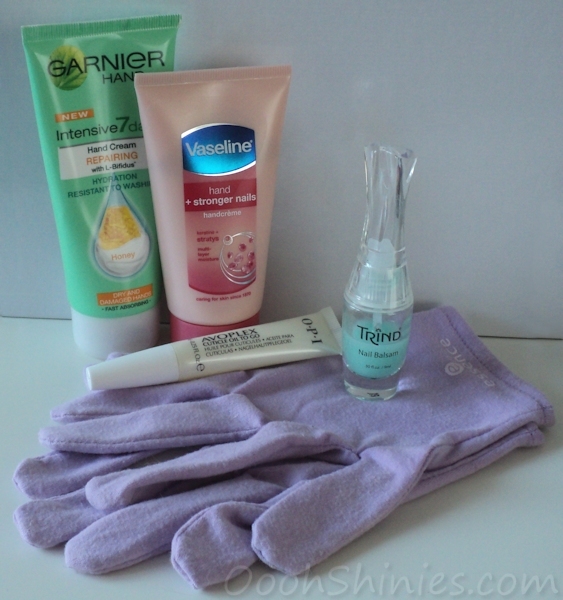 And last, but certainly not least, the hand and nail creams! My favorite hand cream so far is the Garnier Intensive 7 Days Honey cream, it moisturizes but also gives a slightly matte look, I often use this nowadays as well before making photos. Then there's the Vaseline Hand + Stronger Nails cream, I just got this so I'm not sure yet if it actually does anything for my nails, but so far I like it, and it gets absorbed quicker than the Garnier, so easier to use when in a hurry. If I want to give my hands a little extra TLC, I apply a thicker layer of cream and use these Essence gloves and just let it sit for a while. For my nails I have Trind Nail Balsam*. 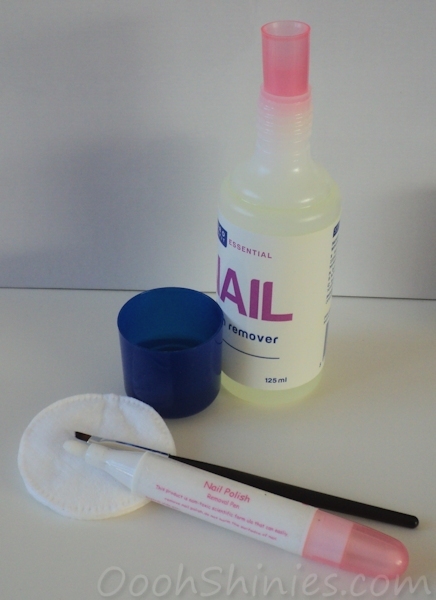 I received the balsam and the Nail Repair (shown with the basecoats) a while ago, when my nails chipped a lot, and Trind thought my nails were maybe dry. I thought it wasn't all that bad, until I applied the balsam to my nails and it was gone in the blink of an eye, lol! As you can see on the bottle, I've used it a lot and my nails really did improve, I'll definitely get it again! 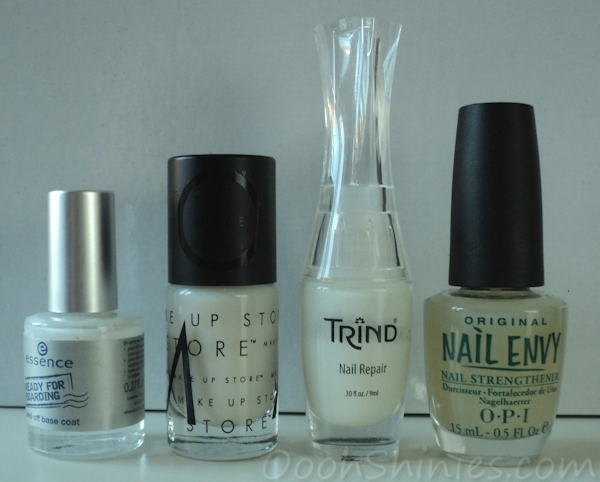 (update: here's a review on several Trind products, including the balsam) For my cuticles I also have OPI Avoplex Cuticle Oil To Go, which I use in periods (I'm sometimes just not in the mood to moisturize a lot! >.<). I know a lot of people love Lush Lemony Flutter, but so far these things work for me so haven't gotten it yet. But I did want to mention it, because I heard so much good things about it, so if you haven't found a cuticle product yet that works well for you, that one might be worth a try. * = The product(s) in this post was/were send to me for review. For more information, please have a look at my Disclosure Policy.